The Self-Promoting Musician is a Berklee Music Guide now in its third edition (2013). In the book, Peter Spellman offers readers advice on how to approach one’s music career with a do-it-yourself attitude. 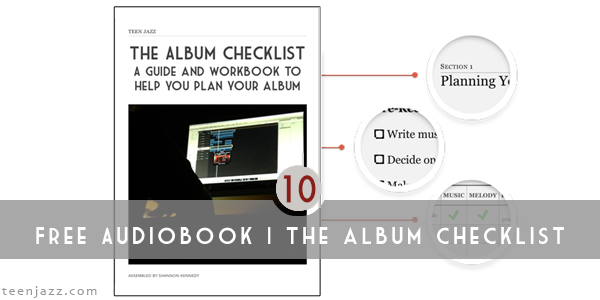 Geared towards self-managed musicians, the book includes sections on social media strategy, getting the most out of your gigs, pursue radio airplay, and keeping your career organized. Spellman’s discussion of the segmentation of the music market and how the music industry is shifting away from big successes to modest successes in more segmented genres. How finding one’s niche just doesn’t mean “jazz saxophonist” it means that the specific style of jazz you play needs to be tacked onto your identity. The importance of improving skills beyond those that you have on your instrument (overcoming shyness, telephone skills, etc.). Overall I found The Self-Promoting Musician to be an informative resource and I would recommend it. Like most music business books available on the market, there is a lot of information included that can be somewhat repetitive. But things like the detailed business plan included in this book can be extremely helpful. 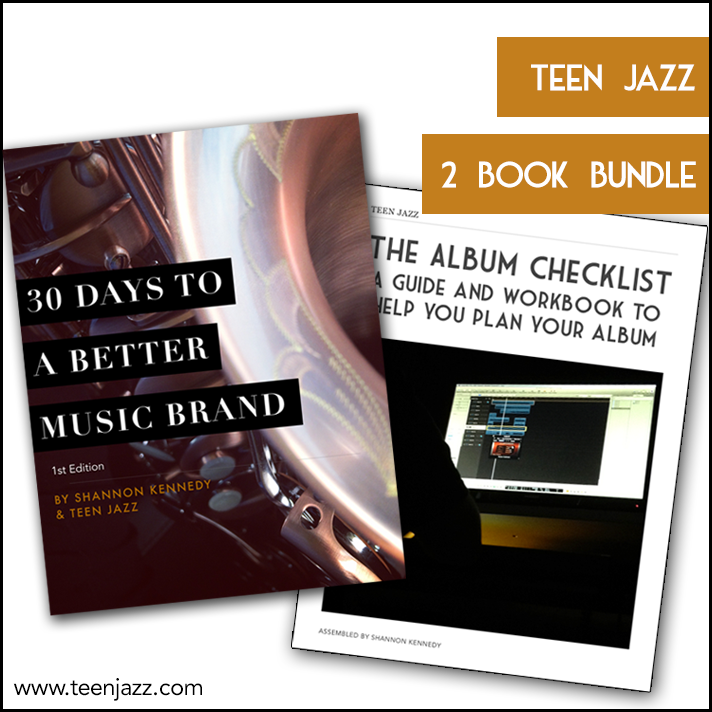 Thank you for supporting Teen Jazz and your own brand as an artist with your purchase of “30 Days to a Better Music Brand”. Don’t have it yet? That’s okay, you can get it here for just $2.99. Welcome to our community page where we can share our journey to better music branding, offer one another feedback, and ask questions. So let’s get to know one another! Share your #TJmusicbranding journey below in the comments. PS > If you haven’t already left one, we would really appreciate your honest reviews on Goodreads! You can share your thoughts on the book here. When we first make the transition from playing music in school to playing music professionally, many young performers are quickly discouraged. We go from competing against and performing with players relatively close to us in age with very subtle differences in ability (with a few exceptions), to doing the same against and with players who have decades more years of experience than us. 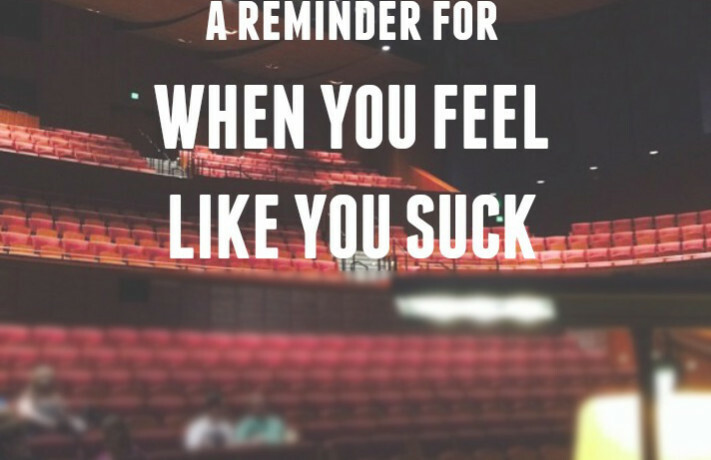 For many aspiring musicians, this creates a feeling of unease, inadequacy, or self-doubt that can become overwhelming. During this stage, one might be tempted to quit. Even before we enter the music job market we’re exposed to hugely successful and even legendary performers because they’re the ones that make it to the top. That’s what we strive for and our goal is often to be “just like them.” The ones whose names we hear on a regular basis. The musicians we don’t see as often are the local performers who work, struggle, fail and try all again on a regular basis to make a living at what they do. We most likely don’t ever see or realize the day-to-day hardships of the average musician until we’re facing them ourselves. Those who become highly successful in music are much rarer than we are often led to believe, and so, our tastes and goals often exceed our abilities or dare I say “luck”. This is called “The Gap” – the period of time where you have to wait for your skill/career to catch up with your desires. This period of time can last longer for most than we might wish it to. But you have to give it time (read years) for your skills to catch up with your hopes and dreams. And while you’re waiting, it can be easy to grow frustrated and impatient, but it’s important to try to stick with it if music is truly what you want to do. Put time in every single day. Work hard on your instrument, your composing, your versatility – whatever it is you’re aiming for. It might be hard to see the progress you’re making on a day-to-day basis but if you are putting in the work, it’s there. Trust me. But it isn’t enough to focus on the music alone. You also have to work on the business aspects of music every day too. Work on connecting with other musicians in your area, on doing the best you can at the gigs you have, on finding new gigs, on creating a consistent artist brand. Don’t wait for things to fall into place. That isn’t going to happen if you aren’t doing the work behind the scenes. It’s easy to forget that other more established musicians have already “paid their dues.” Through your dedication to your music career and your craft, through your consistent hard work you will inevitably continue to to improve and find new opportunities. SK: So a moment ago you were talking about the early Breton music instrumentation, but I’d like to go back for a minute and talk about the way the instrumentation has evolved over time, especially after the folk revival. JM: What you would have heard was mainly singing, of course, in Breton, or in the East of Brittany, singing as well. You would have violin in many parts of the North of Brittany. Violin duets sometimes. You would have had early clarinets. You would of course had bombarde, this mad double reed oboe we have coming together with a little pipes, with one drone, very shrill called binioù-koz. And that would be basically the picture. One very emblematic instrument that was imported was the Scottish pipes. And this was because there was a strong sort of inter-Celtic feeling which dates back to the Romantic period of literature and music. Many people said “we must restore the old links between our cousins.” Scottish cousins, Irish cousins, Gaelic cousins, Welsh cousins, etc. Remember I said that the Breton culture, as well as Brittany itself, was in very bad shape after the World Wars. What happened is that a handful of young people an association called Bodadeg Ar Sonerion which means The Musician’s Assembly. And they decided, they said, “we must restore the pride of the Breton people.” And since many emigrated to Paris, they decided to create the equivalent of the Scottish pipe band, but this time, they added, so they imported Scottish pipes and people learned how to play it in Brittany, or in Paris, the Breton community in Paris. And they added bombarde, which is the oboe I mentioned, several bombardes. So a bagad is very loud, it’s louder than a pipe band actually because of the bombarde because those are very loud. Plus drums like in the Scottish pipe bands. So this started in the early 50s and even a little bit before. So the Scottish pipes were an important importation. During this time, unfortunately, the fiddler tradition disappeared almost completely because of the wars as I said. And many of the people who still could play didn’t want to play any more. It was true for other instruments and also for the singing. Some people came back from the war and didn’t want to sing nor play. So the fiddle had disappeared but it was restored later and we now have several fiddlers. Although, we have lost, we don’t know exactly, how they played back in the 1900s. We know more or less, one or two survived, but strictly in Easterm Brittany. Clarinet was still in use a little bit and the style. Completely with a very strange scale, not tempered scale. Very common in Brittany, like for singers. You’ll find this scale on all wind instruments, singers, and now other instruments too. And later, the folk revival that was all over Europe, you know let’s say from the 60s, guitar started to be imported in Brittany in bands as an accompaniment instrument. The main influence about the style of guitar in Brittany, the main and first influence was definitely the influence of some Irish musician. You know bands like Planxty, especially Paul Brady, Andy Irvin. People were big fans of Woody Guthrie and all that by the way. Pete Seeger and all that. Those people would use the open tuning, the DADGAD tuning. That came to Brittany exactly the same and it always adapts quite well to the modality of the Breton music. So guitar and then of course electric bass or double bass. And a little bit later percussion. There was percussion in Brittany, there were drums. Napoleon period of drums, very rough drums. That’s what we had really. They would accompany clarinets, duets, or binioù/bombarde or sometimes duets of fiddles. But from the 70s, there was a main change in Breton music because bands, not this time bagad or pipe bands, but bands with various instruments were created. Meaning by this, you suddenly had bands with the accordion, the bombarde, a fiddle and the guitar for instance. That would change a lot of things in the Breton music. One of the main things that changed, and it’s also true with other musics by the way, other traditional musics, is, you know, Breton music before that, before the World Wars was a music played by duets of instruments, wind instruments or singers unaccompanied. Or solo instruments. Which means that, I mentioned the art of variation, people would do as many variations they wanted. They wouldn’t play in unison. And even a couple of binoù and bombarde would be completely wild. Some people listen that and say it’s like [?]. The bombarde plays a part and the binioù plays all the time and when he repeats part A or part B of a tune, he can improvise, well I wouldn’t say improvise, he is one the edge of variation and improvisation. So you see, when this music started to be arranged by bands, suddenly they wanted it to be efficient. They needed to play in unison. They needed to play the same thing. The same thing with the bagad and the pipe bands. So it reshaped in a way a big part of our repertoire and it was a main change after centuries of probably changing, but not as drastic I suppose. So a melodic, melodic music became a music for unison, more arranged and little by little is started to evolve into something more sophisticated. JM: Yeah, um, many people will prefer a couple of singers singing for the dance, not necessarily because of the quality of their tone and voice is excellent, but rather because they are able to do variation, literally play with the tune. To change the rhythm inside it to have a good articulation like a tune, and they’ll do, you’ll often hear in the Western Brittany, especially in, because as I said, Western Brittany has kept the language, the eastern part of Brittany has a dialect called Gallo which is of the family of French. Which is literally French. But in both, on both sides on that linguistic limit, you will hear the same type of rhythmic supposition. Three on four, four on three, things like that. If you hear a simple tune going (sings), you’ll have, I don’t know if it’s clear enough, you’ll have accidentals all the time. All the time you’ll have rhythmic accidentals, it’s very common. It’s difficult, of course, to do when you play in unison in a band. So it’s typical of a soloist music I would say. And also, the scales. The scales are very, very strange sometimes and they almost disappeared. Everything was going to be, in a way, leveled like become universal like the piano scale, but it didn’t. It didn’t. And about variation and improvisation, to me, I make a very clear distinction and we know it in Brittany because many Breton musicians in the past thirty years have been involved in experiments with jazz musicians, and not necessarily jazz musicians by the way. I have been part of bands like that and I’ll come back to it. I’ve met some amazing musicians, jazz musicians. But let’s say that variation, you stay on a tune, you don’t, it’s melodic music so you don’t have harmony or, you don’t have a clear chart of harmony on which you can improvise, it doesn’t work that way, traditionally, I mean. So it’s not as if you had a piano playing chords and you improvise on it. It doesn’t work that way. You play with someone, possibly with a guitar but you can’t go too far from the tune traditionally, but this has changed. Now we have traditional musicians who improvise, but to me there is a clear distinction between the art of variation and the art of improvisation. You know, many people in Brittany are interested in other kinds of music like the taxim system of the Balkans, or in Greek, Bulgarian, Serbian and Hungarian, you have all this what you call makam, or taxim. Makam is the Arabic word for it which is a system of improvisation. Well, many Breton musicians study that a lot and they play sort of taxims with their own scale. And also, the improvisation, many people are interested and often Breton musicians have studied with Indian musicians, north India mostly where they are interested in the raga system which is with the talas, the rhythmic setup. And improvisation on a special phrase with ascending or descending scales. Well, this is old to me, music savant, classical music – old classical music. Well, more and more Breton musicians are influenced by that, so improvisation appears in the Breton music, but traditionally, it was not except in vocal tradition from central Brittany which was called kan ha paouez. Which means literally “sing and pause.” It was a very special thing. I met someone who had witnessed, who had heard some of the last of this improvisation in the very early 50s in a farm in central Brittany. What it was, it was a work in common in a farm, people worked in common as I mentioned earlier on, it was several farmers and people, all farmers and people living from the land. They were working the field and they had a pause at midday and it was very hot and one came inside the house where the woman of the house was waiting for them with food and everything, and this man came inside the house singing, improvising on a simple melody. He said basically, putting it in rhymes, improvising it in rhymes, he said basically “we have worked a lot this morning, it was very hot in the field and we didn’t get much cider, apple cider to drink.” So the woman of the house replied to him singing and more or less the same simple tune she could pick up rapidly, and also in rhymes, she said to him, she told him, “well, you have probably worked more than anyone to talk to me like that. To make such a reproach, a grief.” Then a third man started to sing and say “we have all worked hard, this woman has worked hard to prepare food for us so we are not going to raise a dispute.” So this was all improvised. And this is a vocal tradition of improvisation that is not only in Brittany by the way. It exists in other countries, in Asia. So this would be as far as I know, the only improvisation existing in the very old tradition. Everything you will hear now about improvisation in Breton music is inspired from other cultures. SK: So why don’t you go ahead and talk a little bit about how you got involved in Breton music. JM: I don’t think it’s an exception. Many young Breton musicians have more or less, the same thing that I am, I’m not from a musical family in the sense that my father was a great singer, but he wouldn’t sing really traditional songs. He would sing songs he heard from the radio, you know, cabaret singing from the 30s and all that. My father was born in 1917, he is now dead, but that’s what I heard. I didn’t like it very much. He sang funny songs, you know, very, with a lot of sexual connotations and things like that. Funny and he was people in the weddings would love him. He had a fantastic voice, very, very loud. Amazing and very much in tune. But the content of his songs was not exactly what I would expect. Because we were from an area where the tradition had more or less disappeared, the dialect where I grew up, Gallo, which sounds a little bit like what you would hear in Quebec, was still very lively and I heard a lot of it. I heard it a lot and I know it, but I grew up on a peninsula on the coast. It’s a bit remote, a place remote, a beautiful place, but a bit remote and even when I grew up, there were not many tourists yet. My mother didn’t play nor sing any music, but there was a group at the time and a little bit every where in Brittany, hence what I said about, I’m not very particular in that. Back in the mid, from the beginning of the 50s, started many, many groups to restore the pride of the Breton people and groups with costumes, local costumes and to teach the young people to dance and to go on stage to perform with the dance and the music. But this is how I started, but very rapidly. I got in contact with people who had never lost the tradition in Brittany, where it always stayed in use. So little by little I heard this and that and very early, I started with the bombarde, the double reed instrument. I started as a dancer, of course, then bombarde when I was 14, and later I heard wooden flutes, the transverse wooden flute played by Irish musicians. The first time I ever saw was in a big festival in Southwest Brittany, an inter-Celtic festival where there was a group from Ireland and I heard the flute and I thought, “hey that’s great.” A few years later I found a wooden flute which was not at all adapted to what I wanted to do but I started with that. And as I said, being from a remote place on the coast, I didn’t have anyone to explain to me so I was completely self-taught until I met some Irish musicians and that’s how I started. At first, when I played the flute I only played Irish music, you know, there was still in Brittany among young musicians and not necessarily young by the way, there was this very strong inter-Celtic feeling. Ah, the Irish, as they are our cousins, we need to play their music. We need to know it. The other way was not exactly true, the Irish people would come to Brittany, they didn’t travel much to Brittany anyway. But they would like [Breton music] but they wouldn’t try to play it. It sounded to weird to them I think. And so this is how I started until and that’s where maybe my personal history is maybe different from many people in Brittany. Is that people around me started to tell me, “why don’t you use the flute in the Breton music?” And I said, “well I guess I could,” and I started to work on it and it actually and it was the beginning of the long way. Far from being finished, but that the time there were not that many people playing the flute in Brittany. But that’s the story of flute now. But now there are many flute players but at the time there weren’t. What else could I say about my, well, I started to work on… It’s funny how when I started to play flute, I wanted to play, I said I wanted to play Breton music on flute because people asked me so I’ll be nice and I’ll do what I’m told, but then I had to find what will I play? How will I play it? I have no tradition, I have nothing to refer to. So I searched a lot, I listened a lot what I already knew with the singers, the binoù/bombarde player I was as a bombarde player myself. I listened to lots of styles and I started, you know, but the funny thing is, when I started to find the keys to many of the technical questions I was left with is when I started a very precise listening to extra European flute traditions. 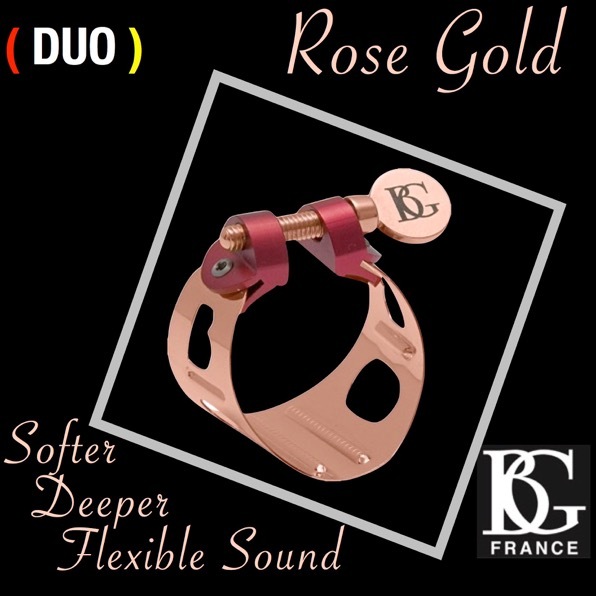 Strangely enough, what helped me to come back to Breton music and have new ideas to play it. I’m not saying I tried to imitate the shakuhachi from Japan or the bansuri from India, or the [?] from Turkey or Iran or North Africa, it’s not that. It’s listening to that and letting all this music sit in my mind I suddenly find a different way of articulating my playing on the flute. And the funny conclusion to that, and there is a conclusion is that one evening I was playing a very traditional fest noz, this dance night I mentioned before in central Brittany and this man from this very distinct style of music came to me and said “the way you played tonight shows very clearly that you have worked very hard on our tradition because the way you play it is really great.” But of course I didn’t tell him that all I was listening to in the past weeks before that was tradition from extra European music. SK: And what would your advice be to someone who was interested in learning Breton music but doesn’t have immediate access to it because they’re not in the Breton region? JM: It’s like learning an instrument. To me when learnt, I was learning on my own. I keep that in a way, I teach many workshops now, so sometimes I teach to someone something that took me two years to know how to do. Now in a workshop of three days, I can explain to a person how to do it, you see what I mean? And then now, someone who wants to approach Breton music, you have the Internet. You have videos. You have loads of music everywhere. Now you have so much that you don’t necessarily know what it is, what it means. So I would recommend, a good thing, is a trip to Brittany and meet some people to have different points of view and know where you are and what style you like. Or else you have some people in every country I suppose who know a little bit about Breton music. By the way, in the United States, there was a a woman who made a lot, who made a thesis about Breton music called “Glorious Culture.” She was from Philadelphia and she came here several times and other people like Larry who play bombarde, you have many people who are interested in this music. But coming to Brittany would be the best start I think, to see exactly. To see it with your eyes and feel it, go to a fest noz and know exactly how it works. And then, after that, you can go back to video and things and you know exactly what it is about. You know what it’s all about. But there again it will be only an introduction because it’s like any other music, and you know that, you all know that. It’s like any other music. It takes your life [to learn it]. Hey everyone – we hope you all had a wonderful New Year’s celebration and that you’re already started on accomplishing all of your music goals for 2015. We wanted to thank you for sharing a wonderful 2014 with us and we look forward to continue getting to know you all in the next year. What Songs Should I Learn for Jam Sessions? We’d love to hear what you’d like to read/learn about in the next year. Please feel free to leave a comment below with your suggestions. We look forward to hearing from you! The following is a guest post by Mark Mercury. Do you ever run out of ideas while improvising? Are you sometimes unable to solo as freely and spontaneously as you would like? A simple yet effective technique is to gently push yourself to create faster than you think you can. One way to do this is to give yourself “creating deadlines” during practice and strive to beat them. It’s amazing what a deadline can do to stimulate creativity. Pick a medium-tempo piece that you will be performing, either one on which you are not yet soloing fluently or a piece that is completely new to you. In a practice session select an eight-bar section, and go over and over those eight bars until you have worked out an approach for playing a great solo on them. Then improvise a great eight-bar solo. There is no need to work out in advance every single note. Just come up with a good approach or framework that you can use for improvising a great solo, and then improvise. To create your approach use any method you prefer, such as trial and error, experimenting with melodic and harmonic tactics for specific measures and chord changes, or planning the general structure of the solo. Keep in mind that this is a creative exercise only and that it is for use during practice. Although you are working things out in advance to a greater or lesser degree, this technique is designed to improve your ability to get completely new approaches and ideas while improvising in a live setting. Next, pick out another eight-bar section and create a great solo based on a completely different approach, but do so in eight minutes. Do this with many eight-bar sections from many different songs until the eight-minute deadline is easy. Then make your time limit six minutes, and create solos on many eight-bar sections. Keep reducing your time limit until you’ve considerably improved your ability to quickly create an approach and play a great solo in the first few tries. Working out with pencil and music paper what you hear or feel on a deep creative level but can’t immediately figure out how to play is an important and valuable tool. By “deep creative level” I mean a strong, natural, not-always-articulate, creative energy level within you providing you with ideas or directions that you instinctively feel are right. What you hear or feel on a deep creative level may be somewhat nebulous, and you may believe that by working only with your instrument it would take you too long to figure out how to play what you hear or feel. Using pencil and paper during practice can help you bring forth and materialize what you are sensing. Working with your instrument, a pencil, and music paper, write down in musical notation each aspect of what you are hearing on a deep creative level. Unless the notes come to you in waves or big chunks, work on capturing one little piece of what you hear, then another and another. If the little pieces don’t come to you easily, work by trial and error. Try one series of notes, then another and another, until you are more effectively homing in on what you originally heard in your imagination. Spend as much time as you need to experiment and discover how to express in notes and/or chords each section of what you are hearing. Go as slowly as you need to, and get as much of your idea translated into notation as you can. You must strive to retain your original idea in your mind while exercising the self-discipline to discover how to say it in notes and then write it down. You may find that your original idea starts to melt away or that it begins to morph into something else. Don’t worry. As you do this exercise over and over you should find that you can more readily capture what you originally heard. As you write your music down, don’t be too concerned with notating rhythms exactly. Unless a very interesting rhythmic idea occurs to you that you definitely want to capture, your main objective should be to get the notes and chords. You may feel some uneasiness as you are searching for the right notes to put down on paper. Ignore that feeling and keep working. You are doing something very slowly now so that later you can do it rapidly, spontaneously, and comfortably. By deciding to state your musical ideas boldly and then doing so, it is possible to excite your creativity into a higher state. Playing boldly makes you more willing to communicate your ideas to the public, and when that happens you open the door to creating many more ideas as you improvise. Also, any remaining self-consciousness on expressing your musical ideas can be greatly lessened by deciding to be bold about your playing. As you are improvising, practice making every phrase you play a strong musical statement. 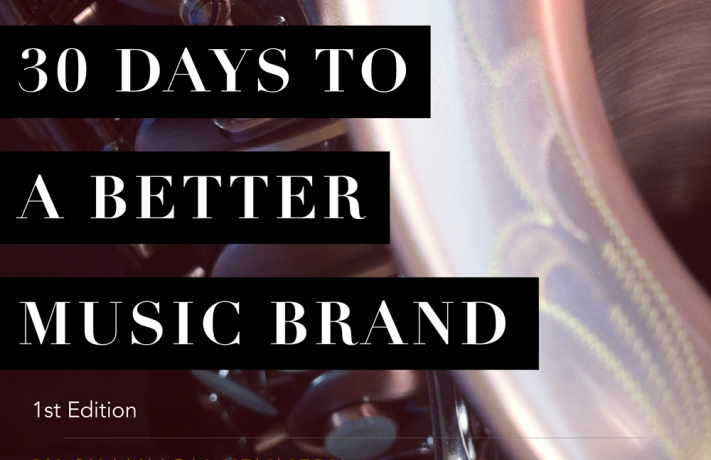 Set the agenda by musically stating ideas in a way that shows how you want them to be. You should be completely taking over the tone, style or feeling of the moment and taking the music in a direction you want it to go. After you get good at this, practice carefully choosing the moments when you want to play boldly. Try to pick the most effective times to do so, when the phrase that you want to play is one that can most benefit from being played boldly. Your ideas don’t even have to be highly original to get benefit from this technique. Just by playing your ideas boldly, you will be helping to free up your creativity. While improvising, if you ever feel that ideas are coming to you too slowly, play some notes boldly to give a boost to your inspiration. Don’t be timid. Be strong. Be bold. Practice being so until it becomes second nature and you have the ability to be bold or not at will. 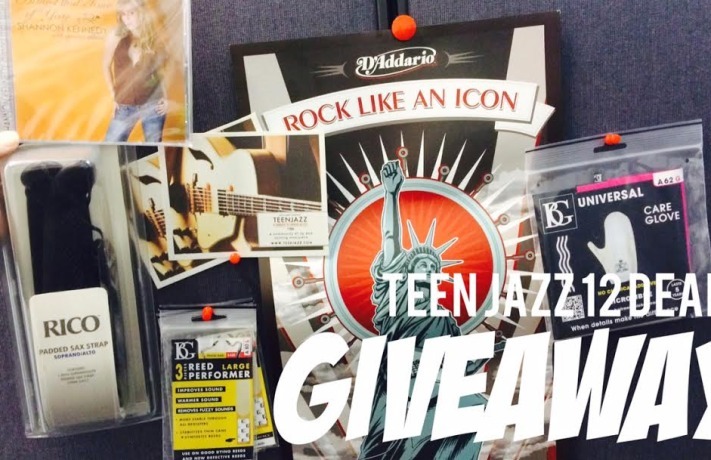 Today we’re giving away a bundle of music and saxophone accessories on Teen Jazz. Sorry this offer has ended. Go back to the 12 Deals of Christmas Main Page. Today we’re offering our upcoming book to you for free if you pre-order it! 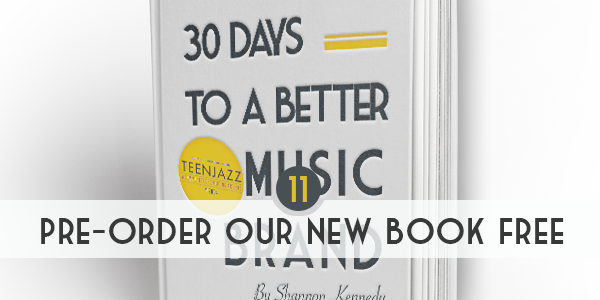 Get 30 Days to a Better Music Brand for free by submitting your email below and we’ll send you the book once it’s complete. The expected release is February 2015. Get the major label sound at the indie price on your mastering, mixing and song production. 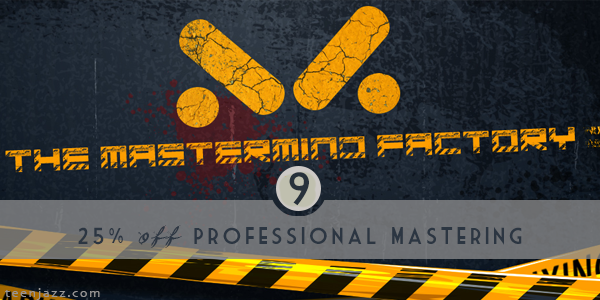 All services are 25% off from the Mastermind Factory – just use coupon code “TEENJAZZ” when you contact them. But if you are ready to get your mastering now, go ahead and use the button below to reserve your deal!